Next time you are muttering darkly about the cost of a new set of sails for your wooden boat, put a happy face on it by donating your old sails to a very good cause. Peregrine Community School is a small independent primary school nestled in the quiet bush environment of Nicholls Rivulet in the south of the small island state of Tasmania, Australia. It is purposely a small school (70 students from Kinder to Grade 6) where children are nurtured to learn and grow in a natural, responsive and engaging environment. We take the time – and create the space – to build respectful and collaborative relationships. Peregrine Community School would like to thank the AWBF for providing us once again with such a great platform to promote our little school and to sell our fabulous Afloat by Peregrine bags which, along with our famous Wooden Boat Raffle, is our major fundraiser. The AWBF is a great way for us to connect with the community and not only raise significant funds for the school but increase awareness that we are always looking for donations of unused, discarded sails which would otherwise be bound for landfill. Our little workshop is run by a team of parents and all the funds raised by this venture go into supporting the school to make it an even better experience for our students. If you would like to see our unique range of bags please visit us at Salamanca Place on any given Saturday or check our Etsy store here. If you have any old sails you wish to donate please contact Lyn Hellewell (our Production Manager) on 62951300 or fundraising@peregrine.tas.edu.au. 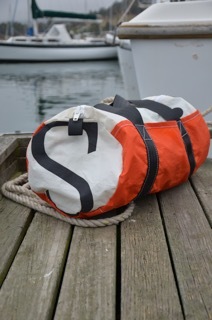 We are happy to arrange collection or freight of sails from anywhere in Australia in return for which you will receive one of our most popular items in the range, the Sou’Wester Utility Bag. Previous Previous post: And We Have a Wrest Point Winner!